The Chief Guest Air Chief Marshal Sohail Aman, Chief of the Air Staff, PAF along with the Golfers. KARACHI: The fifth and the final day was a nail biting competition between Matloob Ahmed and Zulfiqar Ali but Matloob Ahmed won the Championship with a gross score of 285 (03 Under-par). 2nd position was secured by Zulfiqar Ali with the gross score of 287 (01 under par). While third position was tied between Muhammad Shabbir and Waheed Baloch with the gross score of 288 (par). In Ladies, Aania Farooqi won Gross title 6th consecutive time with the score of 91 while in Net Category Ayesha Fauzan stood first with score of 79. Total 325 golfers, including 112 Professionals participated in the Championship from all over the country for Rs 8 Million prize purse, which is biggest prize money in Pakistan. Matches in the category of Professionals, Senior / Junior Professionals, Amateurs, Airmen Golf Course Members, Ladies, Veterans and Invitees were played during the championship. 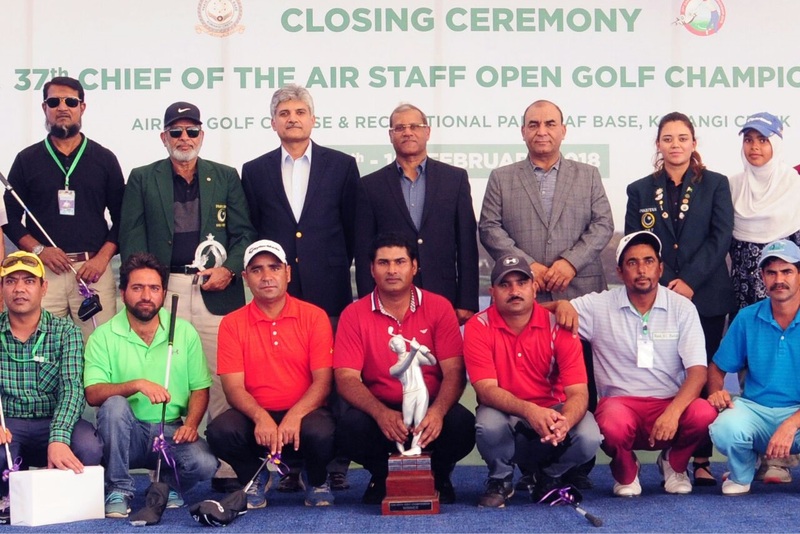 Chief of the Air Staff Open Golf Championship was introduced in 1977 and ever since it has been an annual feature in PGF and PAF annual sports calendars. The Championship was held at Airmen Golf Course, which is one of the most challenging golf courses in Pakistan that presents tough playing conditions with narrow fairways and numerous bunkers spread all over the course. In the concluding ceremony, Air Chief Marshal Sohail Aman, while congratulating the winners appreciated the management committee, officials and personnel of Airmen Golf Course for making this event a success. And as appreciation a Rs 2.0 million for the education of their children as well was announced.